MANILA, Philippines – Another local air travel company has gone viral on social media. 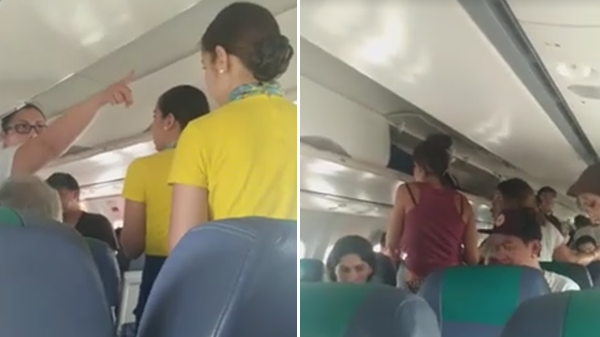 As a netizen posted videos of passengers complaining inside a Cebu Pacific aircraft that caused 2-hour delay, an electric failure inside the plane and worse—passengers were not allowed to go off board. 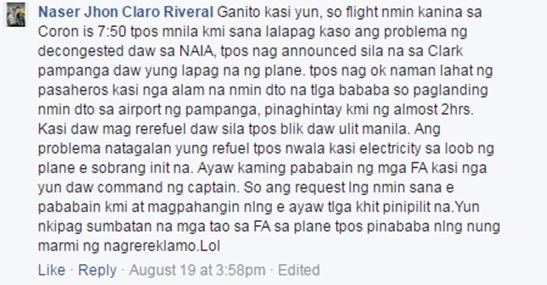 Posted last August 19, Naser Jhon Claro Riveral showed videos of a Coron-flight bound to Manila. In the first video, passengers were seen fanning when a woman stood out of the crowd asking to get off as all were congested inside—suffocating to the heated temperature of the plane. It can also be heard that children are present. Two of the Flight Attendants (FA) patiently talk it out of the passenger whom stated that they’re trying to request a clearance to get the passengers off board but an authority is rejecting the call. Even the foreign commuters loses temper in the second video. As it ends, people inside were seen standing and fanning as it ends. Riveral’s post escalated quickly garnering more than a thousand reactions and 8,542 shares. Netizens were quick to agree and disagree to Riveral’s post. As some reason out that passengers can’t just go off board the plane—saying the crew is to follow strict protocols. While some sympathized with the passengers, especially to the woman whom showed her frustration as children were also inside the aircraft. As of press time, no official message from the Cebu Pacific were made or any plans to reach out to the passengers were given.